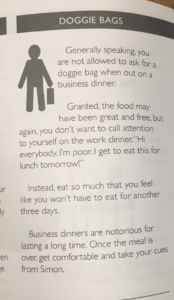 The handbooks, which were distributed at the Stanford Bookstore on April 13, featured a page with the heading “Doggie Bags.” The page provided etiquette suggestions that advised students not to request to-go boxes after business meals at restaurants. The advice first captured the attention of the FLI community when John R. Oberholzer ’19, a Core member for the First Generation and/or Low Income Partnership (FLIP), saw a copy of the book in a friend’s room. Reading through it, he noticed the “doggie bag” section almost immediately. Oberholzer noted that the page’s language trivialized issues that are sensitive for many FLI students, such as food insecurity and hunger. “Being a young FLI professional is hard enough, and the language in that booklet made it clear that FLI alumni wouldn’t be getting the support that non-FLI students do,” he said. After discovering the page, Oberholzer reached out to alumnus Christopher Middleton ‘16, with whom he had previously worked on FLI initiatives. Oberholzer believed Middleton would be able to raise awareness of the issue. On April 17, Middleton posted a response to the incident in a Stanford FLI Alumni Facebook group, as well as on his own page. Pedro Gonzalez ’11 M.A. ’11, senior manager for diversity and inclusion at the Stanford Alumni Association, commented on Middleton’s post. “Hey Christopher, thanks for sharing this. As a FLI alum, I made sure our team at SAA is aware of the issue,” Gonzalez commented. In his comment, Gonzalez also shared a written statement from Leslie Winick, director of alumni and student class outreach at SAA. In the statement, Winick apologized to the FLI community on behalf of SAA. In a statement to The Daily, Winick said that she hoped to provide graduating students a useful guide to life after Stanford. SAA selected the handbook from Cap & Compass, a company that uses humor to teach life skills based on positive reviews and its popularity at other universities. She noted that, though SAA received additional requests for copies of the booklet from some students, she recognized that it had offended others. “After realizing that the handbook included hurtful information, we immediately pulled the distribution of the book for the Class of ,” she added. In her Facebook post, Winick said that SAA currently seeks to make corrections. “We will continue to look how we can best partner with FLI students and alumni so we do it in ways that hold true to our mission of helping create connection, support and a sense of belonging,” she wrote in the post. Winick, Gonzalez and Middleton, as well as Jennifer Rolen and Adriena Brown, representatives from the Diversity and First-Gen (D-Gen) Office, met to discuss the incident and appropriate steps moving forward. Options they considered included soliciting more input from students and FLI alumni when creating future materials for distribution and increased diversity training. Additionally, the meeting attendees discussed continuing efforts to implement a FLI student-alumni network, similar to what already exists for other groups. The representatives from SAA also said they plan to review their relationship with Cap & Compass and to start a conversation with the company and other universities using the materials about the handbook’s problematic content. Both Oberholzer and Middleton expressed appreciation for how quickly and effectively SAA responded to the issue. “They have had an attentive, kind and responsible approach that I personally appreciate,” Oberholzer said. The Doggie Bag page has appeared in the handbook given to the graduating classes of 2016, 2017 and 2018. This year, The Stanford Alumni Association communicated via email that members of the Class of 2018 could pick up the handbooks at the bookstore. Many students and alumni shared the negative reactions they had to the Doggie Bag page. When FLIP Core member Matt Wojtaszek ’18 first saw it, he said, he thought the text in the handbook was a prank. When he learned it was not, he was surprised that no one at SAA had flagged the content. Though he recognized that the booklet was not produced by Stanford, he felt as though SAA should have more carefully considered the contents of the material before distributing it to students. Wojtaszek said that the text did not warrant an extreme reaction, but that it was indicative of Americans’ larger attitudes toward poverty. Clara Luu ’16 had skimmed through the text in the past without taking it too seriously. After hearing Middleton’s and others’ reactions, she began to get more upset. Others noted the handbook was problematic in ways that transcended socio-economic issues. Luu mentioned that the booklet focused on “American” food as if eating one type of cuisine was the norm; there were no etiquette suggestions for eating Ethiopian or Indian food. She also pointed to ways the booklet failed be inclusive towards readers of certain identities — the handbook warns readers not to order tofu steak, and it instructs men not to wear lipstick. Middleton prepared a survey to collect reactions to the booklet from members of the Stanford community. So far, the survey has garnered responses from class years between 1982 and 2021. About half of the respondents come from FLI backgrounds, while half do not. A majority strongly supported SAA reviewing its content-sharing process and discussing the incident with the community. More than 90 percent of respondents agreed that SAA should increase input from FLI alumni. Gathering input from the community regarding how to address the situation is critical to Middleton. Middleton hopes this conversation, which he, the D-Gen Office and SAA are coordinating, will allow anyone who wants to share their opinion to do so. Though a final date has not been set, the conversation is tentatively scheduled for the beginning of May.